Tags: Decorating, Home and Decor, DIY Home, Knock It Off! Design bloggers Monica and Jess meet a couple with completely different style preferences. They design a cohesive office for the homeowners by blending modern and traditional looks on a budget of just $500. Newlyweds Adam and Justin need major help with their home office. With a mish-mosh of furniture and a small space, plus a small budget for decorating, this couple is hoping Monica and Jess can help them create a functional office that's stylish, too. The problem is Adam and Justin's styles couldn't be more different. Adam's inspiration photos portrayed a traditional, clean, cozy office space, and Justin's inspiration photos portrayed a funky, bold, colorful office space. But they had one thing in common: a high price tag. The elements in their photos could cost $5,000 to $10,000, way outside of their $500 budget. Not only does this tiny office space need to mesh two completely styles on a small budget, but also needs to utilize every crevice of the space. Monica and Jess want to create an office that feels happy and inspiring for both Adam and Justin. The first step to brightening this dull, boring work space is painting an accent wall. Jess and Adam cover the current stenciled accent wall attempt with a neon green. Jess is worried about Adam's reaction to this bright color, but the homeowner is game and excited about the bold choice. While Jess and Adam are stepping out of their comfort zone with vibrant colors, Monica and Justin are in their style paradise by getting funky with plywood. The couple starts this wall treatment by taking a blow torch to lightly graze the grain of the wood. This will make the grain on the plywood darker as well as add some flare to the room. Using the table saw, Monica and Justin cut the wood into 16 inch squares. Next, they staple it onto the neon green accent wall, creating a modern but rustic accent wall. One thing Adam and Justin need in their office is storage. The mismatched book shelves they had just created confusing clutter, and Jess is excited to recycle the pieces into an inspirational storage unit. To create a cohesive look, Jess and Adam build door frames for each unit and stretch a piece of bold fabric to cover the frame. Once the units are together, they'll look like one large matching unit that will provide a lot of storage, function and style for the space. Adam and Justin need a large workspace for the room, one they can both use at the same time. To make it work in the small space, Jess gets two tabletops and attaches them together using metal brackets. The tabletops will be mounted on some sawhorse legs for support, but first, they're going to add a funky design element with an unusual material: duct tape. To liven up the plain while tabletops, they use the tape to create bright neon stripes across the top. Although Justin told the designers he's into bold decor, he says he isn't so sure about these crazy neon colors. He'll have to wait and see if it works when they put the whole room together. It's crucial that the team uses every inch of available space in this small office, so Monica and Adam are hard at work to create a floating shelf that will not only serve as a functional storage space but also compliment the funky accent wall. Using the spare plywood from the accent wall Monica and Adam nail together a hollow rectangle shaped box. Since plywood isn't super sturdy the couple then nail 2X4 slabs of wood in the hollow space of the shelf for support. Adam and Justin need their space to be as bright as their ideas, and the boring, outdated ceiling fan isn't doing the job. Screwing together connectors, Jess and Justin create a unique, abstract structure. Once they find a configuration they like they spray paint the structure hot pink. By hacking the old ceiling fan, Jess and Justin are able to create a one-of-a kind light source for next to nothing. When designing on a budget, artwork is usually the first thing that gets left out, but Monica has a great idea for artwork that won't break the bank. Monica and Adam cut different sized circles out of free paint chips and double stick tape them to the plain white background of inexpensive frames. They then use L-brackets on the four corners of the frames to give the frames a high-end look. Monica and Jess love DIY design, so they're excited when Adam tells them he's a screen printer. Using some inexpensive canvas directors chairs, Adam and Justin come up with some great bridge artwork to screen print on each chair. Because the canvas doesn't come off the chair, screen printing directly on the surface is a bit tricky, but Adam makes it work and the result looks chic and fun. While Monica and Jess add their finishing touches to the room, the homeowners are nervous to see how all the funky elements they've been working on will be mesh together. Some of their projects were so out of the box, they made the once-adventurous Justin a bit worried. Adam, however, is excited about each element and wants to see it all put together. When the designers finally reveal the space, the couple absolutely loves what they've done. They both really love the plywood accent wall and how it pairs with the white desk to give the space a modern but rustic feel. They're both impressed with how much more storage they have with both the floating shelf and the framed bookcases, which now look like one big unit. Although Justin wasn't sure about some of the bold elements, he loves how it all came together. They both can't wait to get to work in their new inspiring office and thank Monica and Jess for helping them marry their design styles. Best of all, the team only spent $493 on this fun and functional work space! Monica and Jess have a big request from newlywed couple Adam and Justin: an office that's bold and modern while also being rustic and comfortable. Can these designers marry two contrasting decor tastes and create a great work space for under $500? 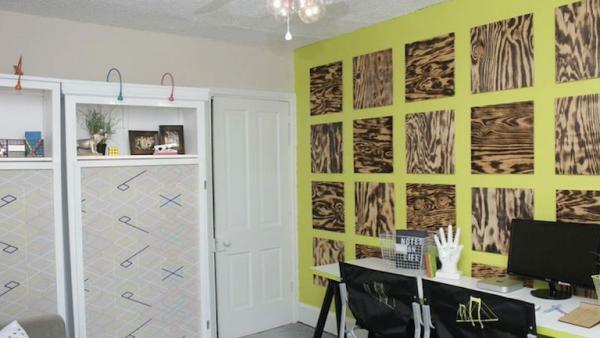 Plywood isn't often thought of as cool or modern, but here's how you can change that perception with this crazy-awesome accent wall project! In only a few simple steps, you'll have a statement wall like nobody else! When you're on a budget, buying office furniture is often out of the question because it's so expensive. Here's how you can easily make a large work space by combining two less expensive table tops into one! If you hate your existing ceiling fan, but need it to keep cool and don't have the cash to replace it, here's a DIY project for you. With spray paint, connectors and some light bulbs, you can update that outdated fan into a great modern light fixture for next to nothing. See how Monica and Jess transformed a tiny home office into an inspirational work space for two newlyweds. Get step-by-step directions and see detailed photos on the projects for the funky, modern office makeover.